This summer, the Archival Processing team is delving into the Music Library’s John Cage Ephemera collection. The Music Library holds a massive collection of John Cage materials, including correspondence, scores, programs, posters, scrapbooks, artifacts, and more. The Ephemera portion of John Cage’s archive arrived in filing cabinets with general date spans on each drawer. As we work through sorting and arranging the materials, we’re highlighting some interesting pieces we’ve found along the way. 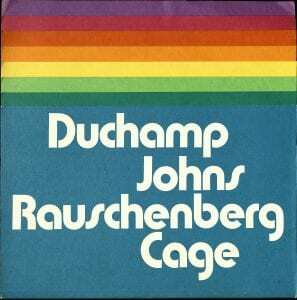 The following programs are from a series of programs, posters and other papers advertising performances of Cage’s music and/or Merce Cunningham’s dance performances. 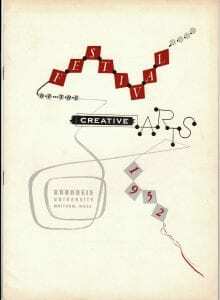 (Left) Brandeis University’s Festival of the Creative Arts began in 1952 under the direction of Leonard Bernstein. 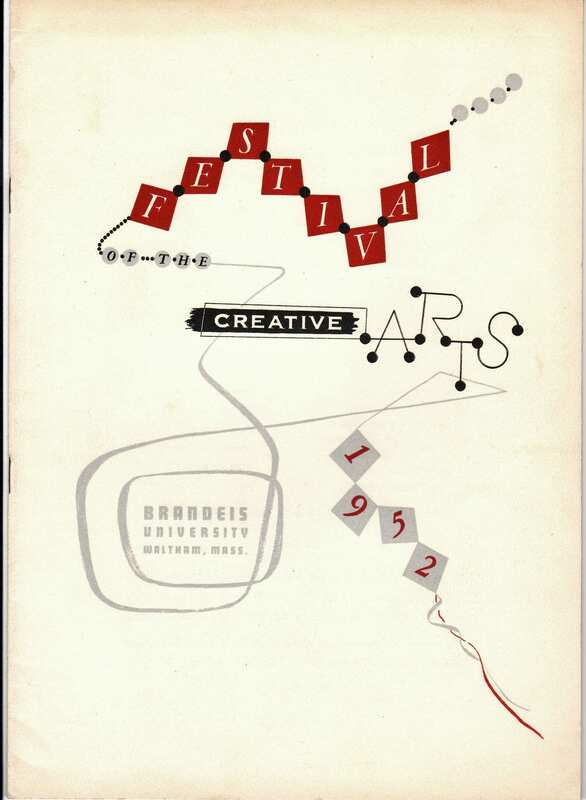 This program, from the inaugural festival, looks decidedly Mid-Century Modern in its graphic design, with its geometric shapes, curving lines, and muted colors. The rectangular shape surrounding the university’s name and city is reminiscent of the television, the new invention taking over the world. Merce Cunningham was a guest artist at the festival. The program designer is unknown. 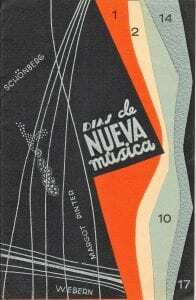 Muted colors and curved lines are also a feature of this 1959 program (at right) designed by Felo Monzón for the Días de Nueva Música festival in Las Palmas de Gran Canaria in the Canary Islands of Spain. The numbers on each colored page of the program represent the date of each performance in July of that year. 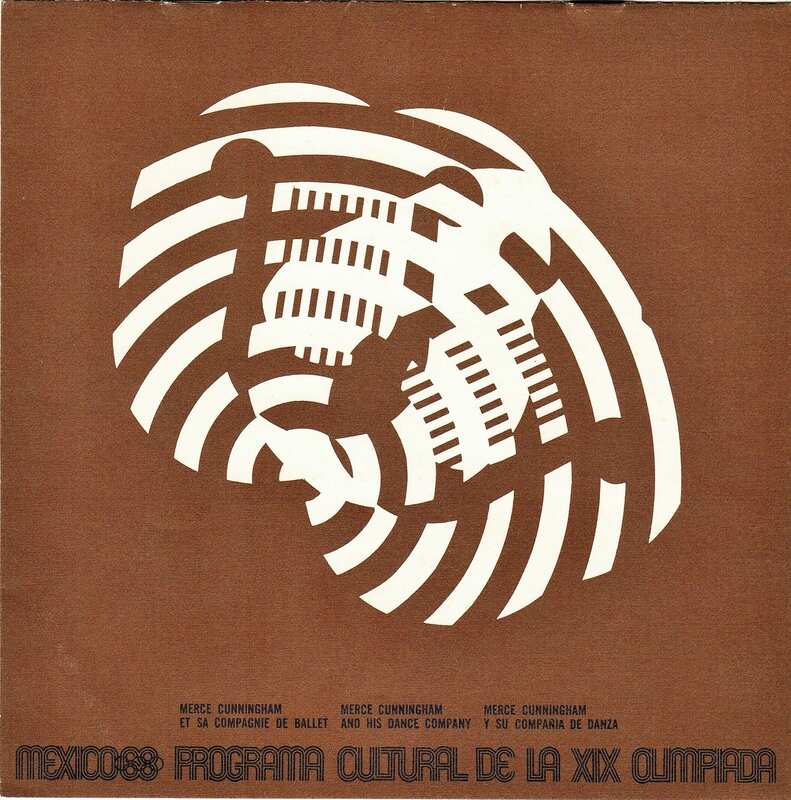 Directed by Juan Hidalgo, founder of the experimental art group ZAJ, the festival included both live performances and recordings of new music, including recordings of Cage’s Quartet and Music of Changes. (Left) Merce Cunningham and his dance company, with Cage as composer and accompanying instrumentalist, performed as part of the International Festival of the Arts for the Cultural Program at the 19th Olympic Games in Mexico City, 1968. The renowned graphics for these Olympic Games, under lead designer Lance Wyman, incorporated Op-Art style concentric circles and lines rippling outward. The design for the cultural portion takes the “68” silhouette and places a lyre (musical instrument) over it, then shreds it apart to give it a sense of motion. Cunningham, Cage, and the rest of the group performed three different programs, twice each across 6 days in July 1968. The stark geometric shapes that often seemed to work against each other in the 1950s evolved into thicker and brighter shapes that closely interacted in the 1960s and 1970s. The thick, rounded lettering of this exhibition catalogue designed by Barron Krody, along with the rainbow color scheme, seems quintessentially ‘70s. This 1971 exhibition at the Contemporary Arts Center in Cincinnati, Ohio, focused on chance and its influence on the four artists. Cage’s visual artwork Not Wanting to Say Anything about Marcel was on exhibit and Jeanne Kirstein performed a recital of his piano works at the Members Opening on January 12. The bicentennial of the ratification of the United States Declaration of Independence in 1976 meant red, white, and blue, stars and stripes in graphic design. The theme even crossed the Atlantic Ocean to France for the 4th Rencontres Internationales d’Art Contemporain in La Rochelle, a festival that presented music, theater, dance, film, and animation. 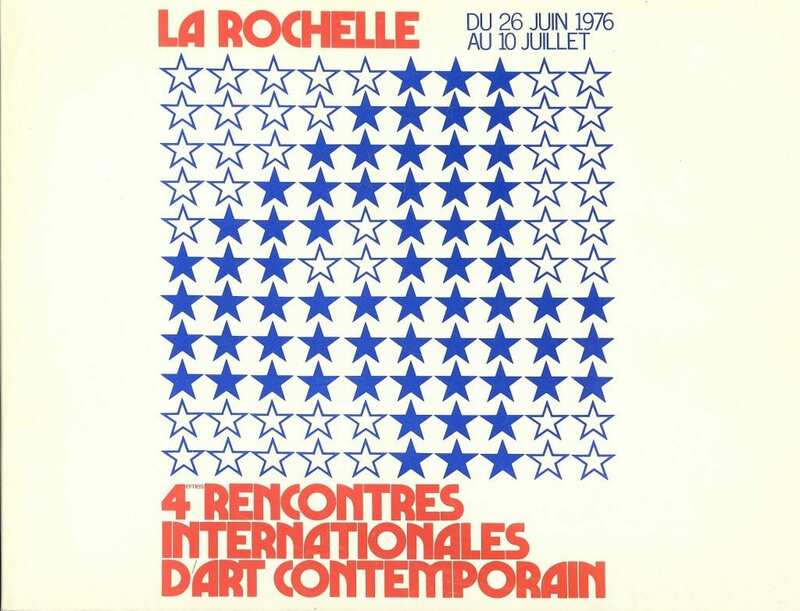 The program and schedule featured here (designed by Sabine de Nussac and Gérard Drescher) use the number 4 formed out of stars to signify the 4th annual event, and likely July 4th, Independence Day. Cage attended a portion of this festival, performing, conducting and taking part in an audience meeting.